Pizza was the first food to go online. The classic phone orders were replaced by fancy “watch as it cooks” widgets. Now Dominoes will automatically place your last order if you even open its app. Yet, pizza isn’t the only delivery food, and there’s companies warring over the rest of the market. Grubhub remains the largest incumbent in the space, but startups from Silicon Valley and heavyweights like Uber and Amazon are now entering the food space too. 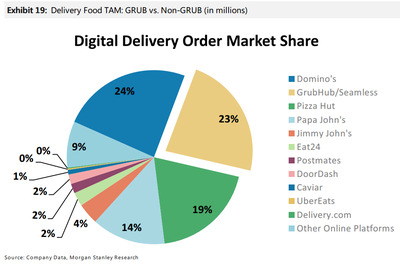 Morgan Stanley Research recently published a report that breaks down how big GrubHub’s lead is on the rest of the competition — and where upstarts like Amazon and Uber could quickly catch up. 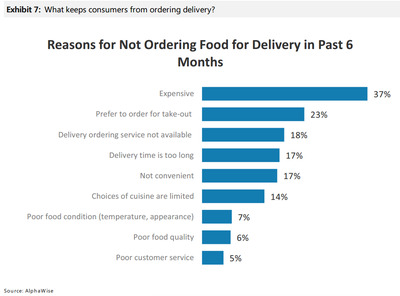 “Online food delivery is still in its nascency as, by our maths, only 5% (or $10B) of the ~$210B core addressable restaurant spend is done through online delivery, and more than half of that is pizza,” Morgan Stanley analysts noted. It's a competitive industry, but it's also still early. Some restaurants, like Pizza Hut, do their own delivery. For others, though, there's a competition about who delivers the food in the end. 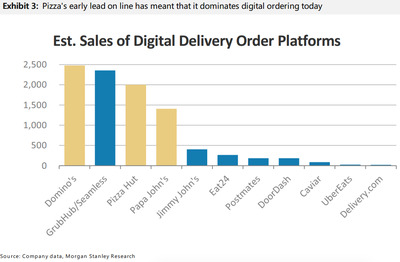 Pizza's early lead for online means it still dominates ordering today, Morgan Stanley says. GrubHub's close behind it, but a lot of the Silicon Valley startups still lag behind. Amazon doesn't even crack into the top of the charts. 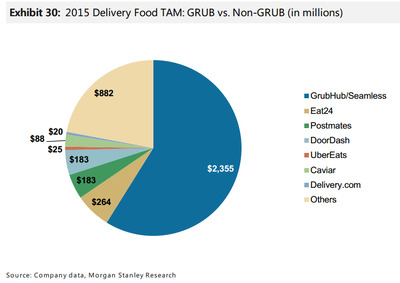 Put another way, GrubHub's 23% market share still dwarfs Uber's 0% or Postmates' 2%. 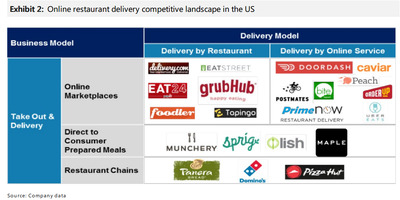 If you take pizza out of the equation, Grubhub clearly dominates compared to the other delivery startups. 'From our previous work, we have found that GrubHub is the largest player in this space at ~$2.4b in annualized gross food sales, nearly 5x as large as nearest competitors Eat24 (owned by Yelp) and Postmates,' Morgan Stanley analysts wrote. But that doesn't mean GrubHub's the only winner. Even though Amazon and Uber might be small players today, Morgan Stanley notes that they 'must be watched given their brand loyalty.' Amazon could offer free delivery to all Prime members and theoretically price it aggressively to undercut other players. If it can drive down the price, it would solve the number one reason people don't order delivery. Companies like Amazon and Uber could undercut the competition if they go for cheap delivery -- most customers don't want to pay above $5 for a delivery fee. Uber and Amazon are both following the GrubHub model of a fee structure, splitting the burden between the restaurants and customers. 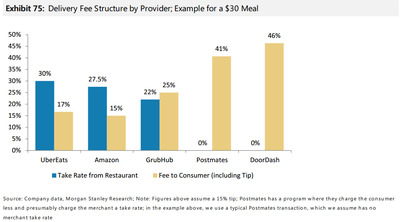 Postmates and DoorDash though shift it entirely to the consumer. This has helped the startups strike high-profile relationships with chains like Chipotle and Starbucks since they don't have to discount their products, Morgan Stanley said. But, if delivery fees are too high as a result, the companies might struggle long term, since customers don't like to pay over $5 for delivery. 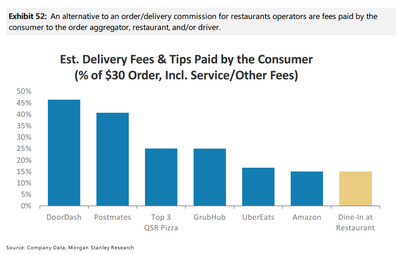 As the Morgan Stanley chart notes, this is for the general Postmates service. It's experimenting with programs like Postmates Plus that have fixed delivery costs. The cheapness of UberEats and Amazon is great now, but Morgan Stanley thinks it will eventually come up to meet the pizza chains level. 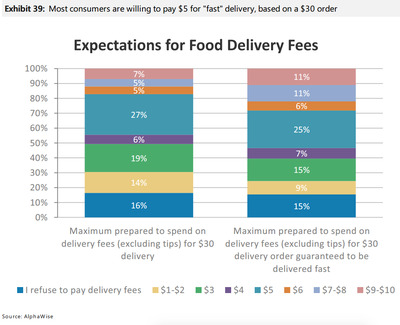 'In comparing various delivery services (we used a $30 order as the baseline to determine percentage of additional delivery costs), DoorDash and Postmates ranked highest in terms of all-in costs (>40% of the $30 order charge), while UberEats and Amazon were the lowest. Over time, we would expect the average all-in delivery charge to trend to where major QSR pizza chains sit (~$3 plus driver tip), given that market's maturity,' Morgan Stanley wrote. The other area where UberEats and Amazon have to grow? The selection of foods available. 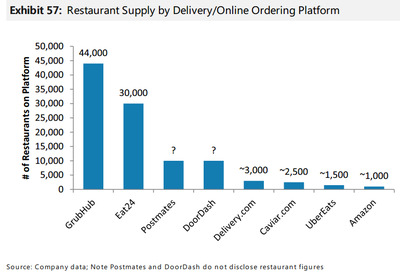 GrubHub has more than 44,000 restaurants on its platform, compared to the ~1,000 available for Amazon delivery. While Eat24 may have a larger market share of deliveries than Uber, it still lags behind on consumer awareness. 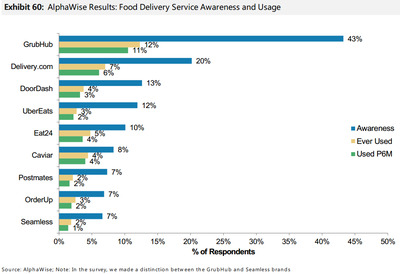 12% of customers have heard of UberEats compared to Eat24's 10% or Postmates' 7%. And that harkens back to the threat Morgan Stanley identified early: Uber and Amazon 'must be watched' given their brand loyalty.